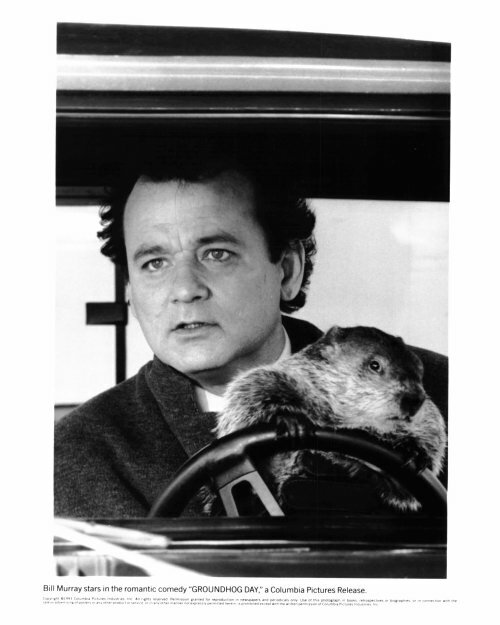 Lately, I have been thinking a lot about the movie “Groundhog Day” where weatherman, Phil Connors travels to Punxsutawney, PA to cover the annual event. During his half-hearted report, a snow storm not only traps Phil and his crew in Punxsutawney overnight but also in an infinite time loop where every day is Groundhog Day. Initially, Phil responds selfishly to his situation. Realizing the loop is never-ending, he becomes despondent. However, with the encouragement of his producer Rita, his life transforms as he betters himself, learns about the townspeople and selflessly helps others. If we allow it, our lives can easily become infinite loops of mundane events just like Phil’s. She was all about the mundane – busily preparing dinner, setting the table, drowning under the weight of mundane details while her sister, Mary sat at Jesus’ feet. Martha lost sight of the lasting significance of learning from the Master and demanded help in the mundane. “Tell her to help me,” Martha demanded of Jesus. And Jesus answered, “Martha, Martha, you are worried and troubled about many things. But one thing is needed, and Mary has chosen that good part, which will not be taken away from her.” Luke 10:38-42. When we sit at the feet of our Master and listen to His Word, we grow in intimacy with Him. Through one-on-one encounter, we discover His character and are inspired to become more like Him. In time, we fall in love with the Bridegroom who does everything He can to win our affection. Over time, we become selfless and place the needs of others before ours. When we face the responsibilities of each day, help us choose spending time worshipping at your feet and growing in intimacy with you, first. Fill us with Your love so that we may share it with those in our sphere of influence. We thank You that Your love turns the ordinary into the extraordinary. Amen. To learn more about Rob Dunne, please visit our Contributors Page. Lately, I’ve been repeatedly confronted with a rather scary conviction that I all too often treat my Christian faith more like magic than actual faith. I wonder if this happens to anyone else. See, magic is essentially a system of belief in which the people have control over the deity or spirit or force or whatever. Magic, I think, is best likened to math. If x + y = z, then every time I do x and y, I’ll get z. And z is what I want. I want to see, for example, a particular friend come to know Jesus (z), so I show him the four spiritual laws (x) and pray for him in my bedroom at night (y). And as long as I do both x and y, z should just be a matter of time. Faith, on the other hand, is relational. It may be that I want z, but to get it, I’ll enter a relational dialog with God. It may then be that God will ask x and y of me, but it may be that He’ll ask of me just a or b. Either way, there is no formula. I would say that with faith God is in control, but that’s only half the truth. With faith, both parties exhibit some level of influence on the relationship. It’s a collaboration. What does this say about the nature of Scripture? It means that we cannot presume a situation in which the Lord downloaded words to the various biblical writers. Such a scenario degrades the human writers and violates their respective wills. This is akin to any number of ancient gods who essentially had total disregard for human affairs. It is not the character of Yahweh. Neither can we posit a scenario in which the biblical writers somehow coerced their works from God’s mouth. That is divination and the essence of ancient idolatry. So when we conjure in our minds the process in which the Lord worked with human writers to communicate His message with His people in various times and various places, we ought to imagine something more like a chat between friends, in which both parties have say in the message and the medium. We should not, I do not believe, imagine a dictator dictating to a lowly scribe. Who Can Stand Against God’s Children? Joseph’s brothers wanted him out of the picture. He had too much favor and was regarded as a threat to his brothers. When we think of persecution we think of someone suffering because they profess the name of Jesus. This is true, but it’s interesting that the root of much persecution is not simply the profession of Jesus, but the power that accompanies it. This power brings favor and change to everything it touches. If the bearers of that Name preached a name with no power there would be no reason for persecution, but because the godly flow in favor from heaven, jealousy is aroused from man and demons. The persecutions in the book of Acts were rooted in fear and jealousy, so was the tragic persecution to Hebrew babies under Pharaoh and again under Herod. Jesus Himself was persecuted because the favor on His life was too much for the religious leaders, they had to get Him out of the picture. He was a threat; jealousy and fear was the root of the persecution. Peter and Silas were persecuted because there was favor flowing from their lives and the religious leaders were jealous. Paul was persecuted because his message became so popular with the people that the business of ‘idol making and temple worship’ was suffering financially. Too much favor. I remember the days when I thought I was suffering for Jesus when I lacked wisdom in my ‘witnessing’. The persecution spoken of in the Bible was not self-imposed and was not due to a contentious spirit. When we live a life of love and Holy Spirit power -favor will rest on our lives; this favor from heaven will arouse jealousy and often fear. I believe this is the root of persecution even in third world countries; the Name carries too much favor is a threat. “Everyone who wants to live a godly life in Christ Jesus will be persecuted.” (2 Timothy 3:12) There’s no way to avoid persecution if you walk in heavenly favor. Favor is accompanied with power and this will lead to change around you, both in people’s lives and structures in society. This is an excellent thing, it’s what we long for, but this increase of favor will arouse jealousy in some. Josephs’ journey was marked with persecution due to the special favor he carried. The time came when Gods’ favor over Joseph was so great that no man or demon could resist him and God took him to his place of destiny. God used the sin that was committed against Joseph to eventually bless him. This sin that was intended to remove Joseph from his place of destiny was directly linked to Joseph being thrust into his place of destiny. God used all injustices against Joseph to take him to the palace. “And we know that in all things God works for the good of those who love him, who have been called according to his purpose.”(Romans 8:28) This is not to say it was Gods idea for Joseph’s brothers to sell him into Egypt, but God has promised to take the weapons used against us and refashion them into tools for blessing. The night was truly silent as I walked down the hallway toward the living room. Tiny particles of dust danced from my eyelashes and fell lightly down my rosy cheeks. Confusion quickly set in when confronted with a seemingly impenetrable fortress. Layer upon layer of sticky plastic encased the Louvre doors like a butterfly going through metamorphosis. Behind the doors, I pictured dozens of multi-colored boxes cascading beyond the daintily skirted tree. Who devised this fiendish plot to separate me from the frenzied joy I longed for? Was this the work of elves or had a band of marauding pirates blockaded themselves behind the doors? No, this was simply a pre-emptive measure to keep three miniature tornadoes from wreaking havoc on an otherwise Rockwellian scene. Fortunately, Father God has devised no such plan to keep us from the heavenly gifts He freely offers us. First, there is the gift of His love. Since God is love, He offers us Himself. How I wish the world would fully comprehend the depths of His love. God the Father sacrificed His only begotten Son Jesus to redeem mankind. Can you imagine giving up your most prized possession to win the heart of an indifferent person? I can’t. Second, He offers us the gift of grace. “For by grace you have been saved through faith, and that not of yourselves; it is the gift of God, not of works, lest anyone should boast.” Santa Claus maintains a naughty and nice list to determine who is rewarded with presents. God is not concerned with your good deeds. Rather, the gift of grace is free to everyone who believes by faith that Jesus is God’s Son. Third, when we believe that Jesus died for our sins and surrender our lives to Him, God adopts us. To this day, I am still trying to wrap my mind around this one. By law, an adopted child is treated the same as a biological child. When the inheritance comes, your share is the same as biological child’s share. God also blesses us with brand new identities. He restores the pristine image we once shared with Him prior to the fall of Adam and Eve. God re-writes our DNA, demonstrating to the world that we belong to Him. The world can “see” Jesus inside of us. Amazing! Let us remember in this New Year, to praise God for His eternal gifts of His love, grace and adoption that far outshine those temporal Christmas gifts we just opened a few short days ago.